the dough is a lot more malleable than the one I was using in my original recipe. With this one I am able to make ravioli, fettuccine, lasagna. No more store-bought corn and rice pasta (truly not my favorite) ! With teff flour making up almost a third of the ingredients, this dough has a lot more character. My next challenge will be to forego the starch entirely. I would also love to think that less carbon dioxide is generated producing a tablespoon of chia seeds rather than an egg 🤔, but that is less than sure – unless of course you decide to grow it in your own garden, somewhere between the basil and the strawberries ! Set the chia seeds and psyllium to soak in water. After about 5 minutes a gel will form. In the meantime, weigh the rest of the ingredients. When the chia slurry is ready, add the flour mix. Start mixing with a fork, then knead with your hands. 2. You can speed up the process by mixing slurry and dry ingredients in a food processor, but you will still have to knead by hand. At first, you may think that the mix needs more water, but as you proceed it will gradually become more and more malleable. After another 5 minutes (total time not using a food processor), the dough can be stretched without breaking (see video further down). It is ready. At this point put your dough in the refridgerator, wrapped in plastic, for at least one hour. Roll out some of the dough into a thin layer. Gently press a small square mold towards the top of the dough to outline three consecutive ravioli. I use a recycled verrine container that I found in one of my kitchen cabinets. No doubt you too have something that can be used for this purpose. A big lego-type block stolen from your kids’ toy box, might even do the trick 😉 ! Using a square mold allows me to make three ravioli in one shot, much faster than making individual round ravioli ! Place some filling inside each imprint, then fold the bottom part of the dough over, using the silicone mat as a guide. Separate each ravioli using the mold and a knife for the edges then place on a tray lined with plastic wrap. When you have used up all the dough, place the tray in the freezer until hardened. Detach them from the plastic and keep them in a freezer bag until cooking time. Roll out the dough thinly (between a silicone mat and platic wrap, same as for the ravioli) into a rectangle and patiently 😇 draw parallel lines with a knife and ruler. Then flip the whole thing on a tray, gently peel off the silicone and place in the freezer. When the pasta has hardened, detach them from the plastic film and store in a large freezer bag until cooking time. 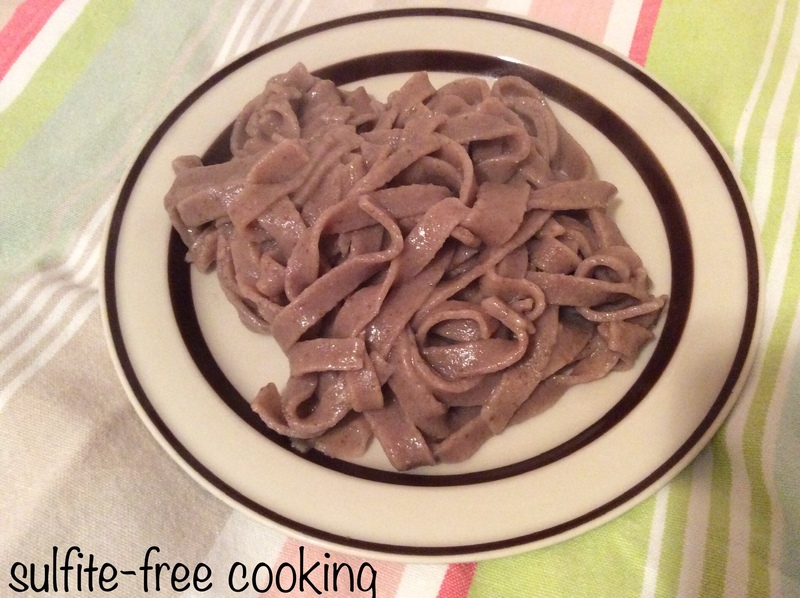 A note on gluten-free pasta making : the first time I made my own gluten-free fettuccine I used a recipe from a dear neighbor, made with nothing but buckwheat flour and flax / egg. Add pasta to a pot of boiling salted water, stir gently with a wooden spoon to prevent sticking and count 6 minutes after boiling has resumed. That’s it, dear neighbors. I love making pasta. There is something terribly regressive about kneading the dough, rolling it out, cutting and patching up pieces when necessary… I have often wondered why I do, and I think I have finally figured it out : when I started school in my home village, last century, there was no kindergarten for younger children. I just went straight to first grade, thus being deprived of all the pleasurable activities of nursery school, and play dough in particular ! So I get my little kiddie fun now – better late than never, right? Next When life give you lemons, use them!